Cam Newton's comments set off a firestorm in sports journalism. If you're into sports, into journalism, or into both — you probably heard about Cam Newton's (the Carolina Panthers quarterback) recent response to reporter Jourdan Rodrigue who asked him a question, and basically, did her job. "It's funny to hear a female talk about routes like — it's funny," Newton responded. The humour was lost on many, including women working in sports journalism. Women with some level of visibility, especially in male-dominated fields, often face particular job hazards that men are able to avoid. Rodrigue was the latest example, but not the only one — consider just this past August, when Radio-Canada journalist Valerie-Micaela Bain requested the public's help identifying a man who kissed her without her consent on camera. We must remember people are not knowledgeable because they are men or white or rich. "We must remember people are not knowledgeable because they are men or white or rich. Neither are people smart because of certain racial or sexual biological features. Rather we acquire knowledge through study and experience. What make us credible are not our biological features but the actual knowledge we possess." Many female sports journalists spoke out after Newton's recent comment (for which he has since apologized), and one of those women is Kayla Grey, an anchor and reporter at TSN. Combining her love of storytelling with her passion for sports — "my grandmother would watch [Blue Jays games] with the TV on mute while my grandfather would crank the radio" — a career in sports journalism was a natural fit. Sometimes you feel as though you are constantly having to prove your credibility. That career has come with its ups and downs, not least because of her gender. "Being a woman in this industry has had its challenges," she tells HuffPost Canada. "Sometimes you feel as though you are constantly having to prove your credibility. You feel as though you can't make as many — if any, mistakes." And what did she think of Newton's comment? "When I first saw the video from the news conference all I could feel was disappointed," she says. "Disappointed that he didn't just answer the question, because it was good regardless of who it was coming from. Instead, he was so stumped on the fact that a woman was asking it." Taking it back to last night at the @biosteelallcdn game . The perfect finale to an incredible weekend showcasing the next crop of Canadian talent who will shake up the basketball landscape.Scouts representing 20 different teams in NBA were in attendance to check out who's got next North of the border. Grey can relate. She recounts a time when a basketball player she interviewed expressed shock at her stats knowledge. When he exclaimed, "Wow, you really know your stuff!" Grey responded with "What? You think I just showed up here with no stats?" "I honestly didn't take much offence to it," Grey says. "I should know my stuff, but sometimes you have to let people know you mean business." I take pride in surrounding myself around men and women in the industry that are supportive but also not afraid to reel you in. For Grey and many other women in sports journalism, comments like Newton's aren't the only ones they contend with. Male colleagues can also be an obstacle to overcome. "Won't lie, I've had my run-ins in my career. Men thinking that you're in it for the worst reasons. I take pride in surrounding myself with men and women in the industry that are supportive but also not afraid to reel you in. You need those kinds of relationships for your sanity," Grey says. "Thankfully, I'm in a space where my colleagues treat me with respect and don't back down or soften any conversations because I am a woman." As we've seen for decades, race is an indelible part of professional sports, and this is mirrored in sports journalism. 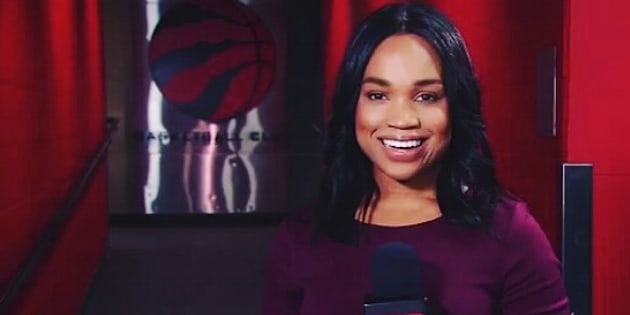 "For me, the hurdle as a sports journalist in Canada isn't so much being a woman — it's being a woman of colour," shares Grey. "We've still got a ways to go. I see that more than ever with the way race has been at the forefront of many topics in sports these days, and the lack of care to get actual black voices in Canada to speak on it is troubling." Being the 'only' in a locker room can often feel very lonely. As Grey states, "Being the 'only' in a locker room can often feel very lonely," but as more women take up space in sports journalism, the hope is that the industry will become more equitable, from all angles. What advice does Grey have for girls or women interested in sports journalism? "I would say always remember your "why?" Why are you doing this? Why did you fall in love with sports ? Why is your perspective so needed in this industry? Once you have that written down — never forget it, because you'll need it for the highs and lows," she shares. "People will try to test you and your existence in this space. Understand that you belong wherever you've worked hard to get. I would also say don't be too hard on yourself, the ball still bounces."